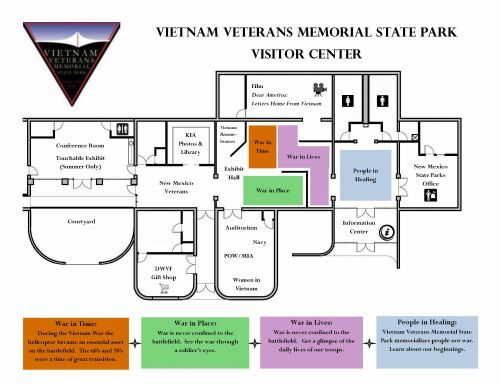 This section recognizes the contributions of both civilian and military women during the Vietnam War. 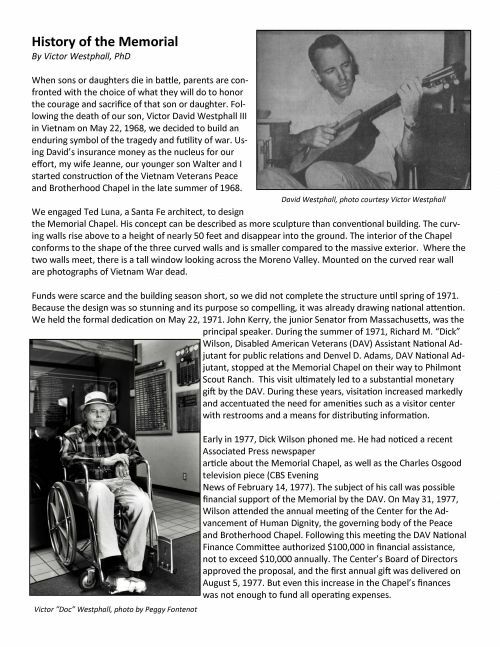 Santa Fe artist, Glenna Goodacre sculpted this scale model and submitted it for consideration as the Vietnam Women's Memorial. After her piece was selected, the model was donated to the Memorial. On a fateful day in 1973, Red Cross volunteer Mary Ellen Norwood made it a point to be at Clark Air Base to greet returning POWs. "I have no idea what possessed me to ask some of them for their autographs but I'm glad I did!" This rare photo sequence is from an American POW release in March 1973. The photos were taken by an Army liguist using a borrowed camera. He had to be extremely careful - only an authorized photography team from Canada was permitted to shoot pictures. 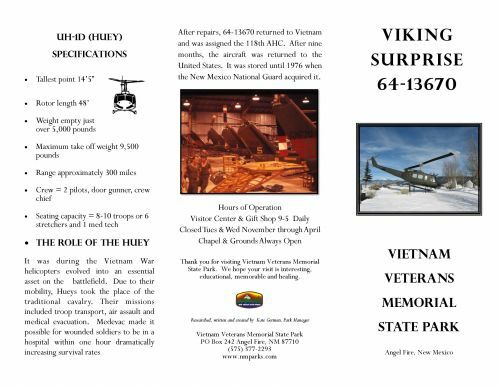 Our Huey served with the 121st AHC as a smokeship and earned the name “Viking Surprise”. 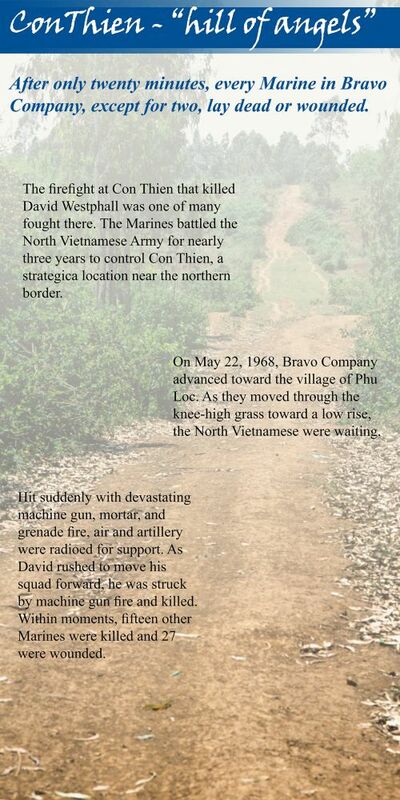 In March 1967 it was badly damaged rescuing troops in the Mekong Delta. It returned to base badly damaged and was rebuilt on the USNS Corpus Christi. After it was repaired this aircraft returned for duty with the 118th AHC. 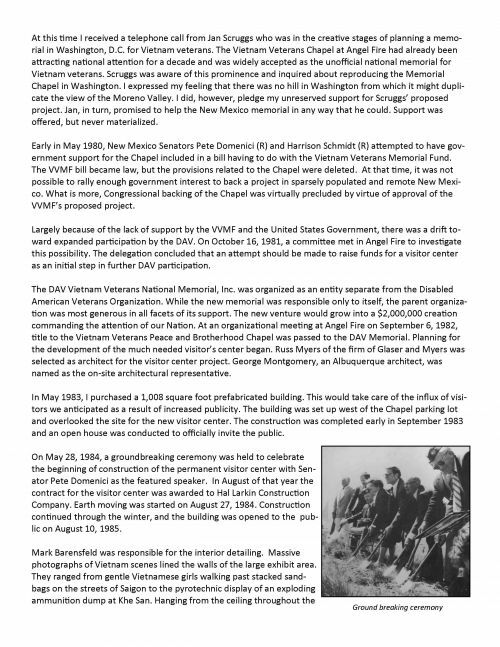 In 1999 the New Mexico National Guard donated it to the Memorial. 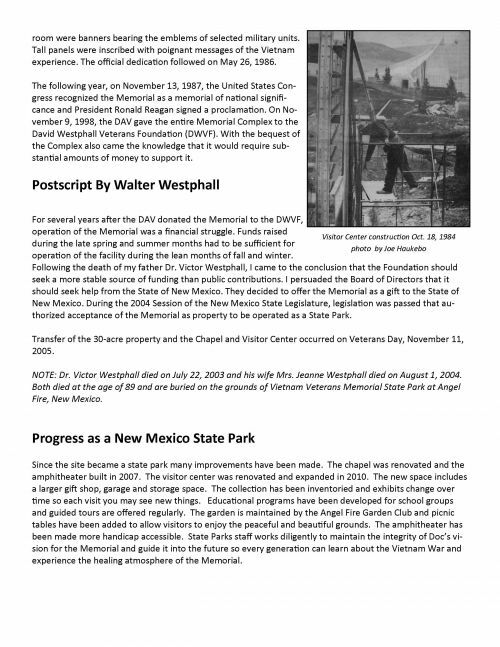 The Memorial’s amphitheater was completed in 2007 and is used for Memorial Day Weekend, Veterans Day and other events. It has also hosted concerts, picnics and a Shakespeare series. 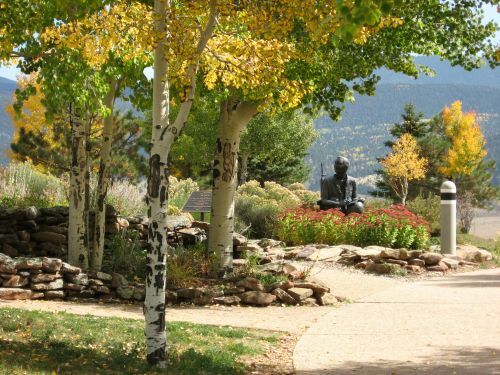 The Memorial is open year round and fall colors are usually spectacular. The sculpture, Dear Mom and Dad is by local artist Doug Scott. Every month the state flag changes to match the photos on display. Our visitors leave tokens of remembrance behind to honor their loved ones similar to what happens at The Wall. We regularly collect them and add them to our archive. 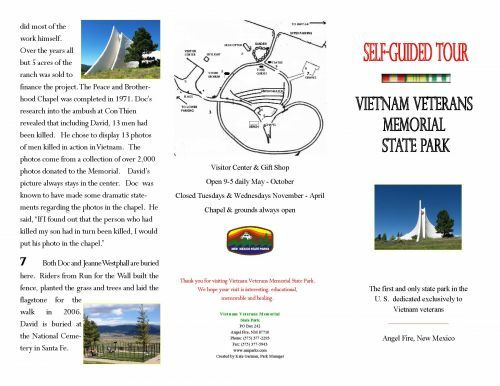 The Chapel was constructed from 1968-1971 and was the first major Vietnam memorial in the United States. 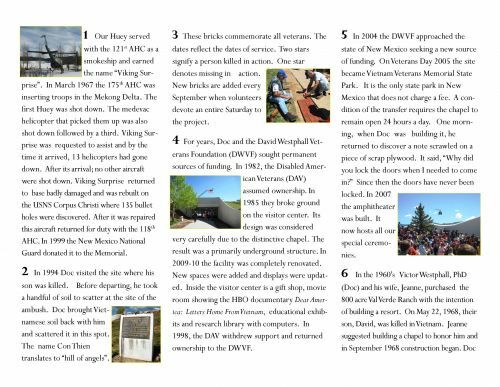 The site received wide attention in the 1970’s and helped inspire the establishment of the Vietnam Veterans Memorial in Washington, D.C., in 1982. 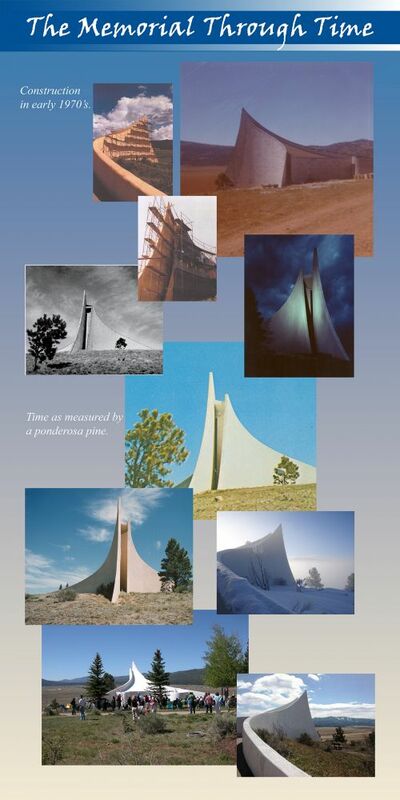 In 1987, Congress also recognized this site as a memorial of national significance. 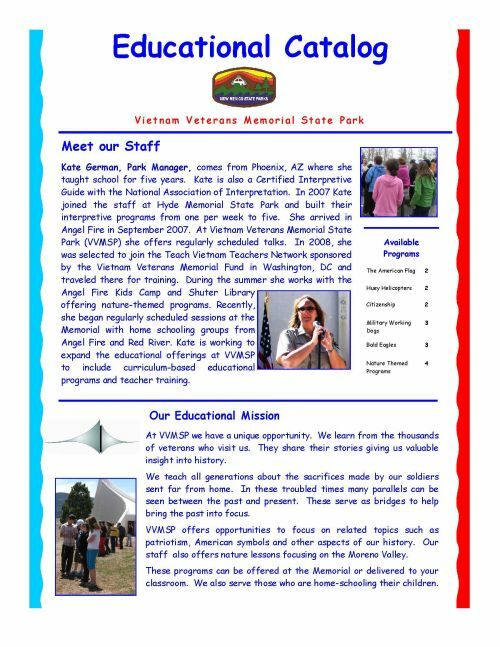 Vietnam Veterans Memorial State Park is a special, emotional and powerful place for America’s Vietnam veterans and hosts over 40,000 visitors annually. During the winter months our park remains open. Sidewalks are cleared, parking lots are plowed roads in the area are well-maintained. The golden yellow has been the traditional color of Vietnam for over two thousand years. The red stripes represent three regions: North, Central and South Vietnam and the blood of the struggle for independence throughout the country's history. This was the official flag of the Republic of Vietnam from 1950 to April 1975. Kids and adults alike are encouraged to handle many of our objects. During the summer months the Conference Room becomes our Kid Friendly Zone with even more touchable items. Touchable Exhibits Kids and adults alike are encouraged to handle many of our objects. During the summer months the Conference Room becomes our Kid Friendly Zone with even more touchable items. Both Doc and Jeanne Westphall are buried here. Riders from Run for the Wall built the fence, planted the grass and trees and laid the walk in 2006. 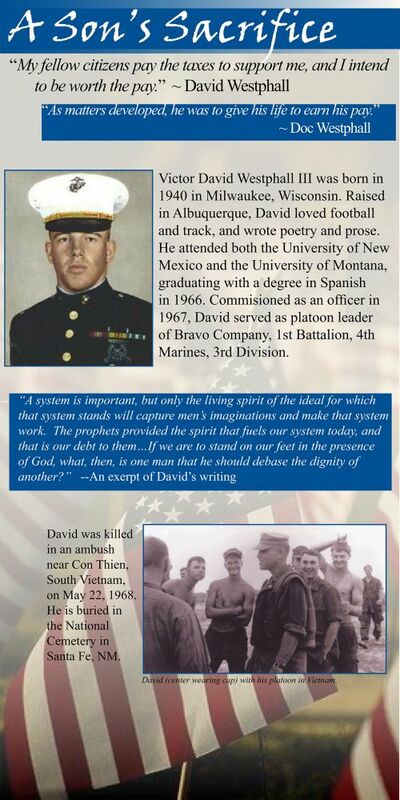 David Westphall is buried at the National Cemetery in Santa Fe. U.S. flags are retired annually and attendees are invited to participate in the ceremony. 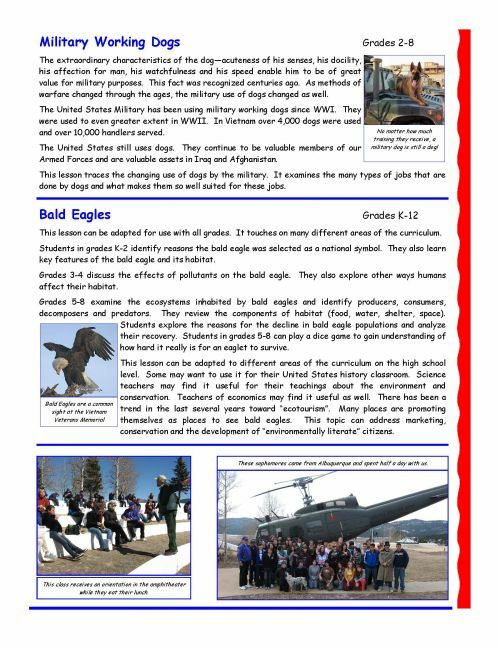 Flags are collected year round and can be dropped off at the Memorial or Angel Fire Fire Department Station 1. 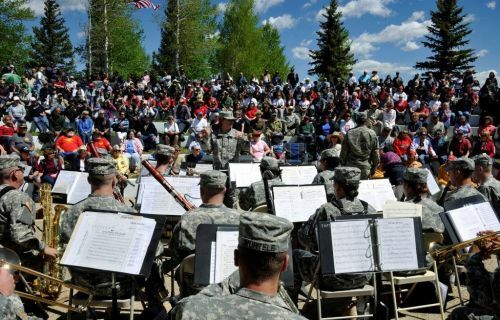 Our amphitheater hosts all our big events including Memorial Day and Veterans Day . 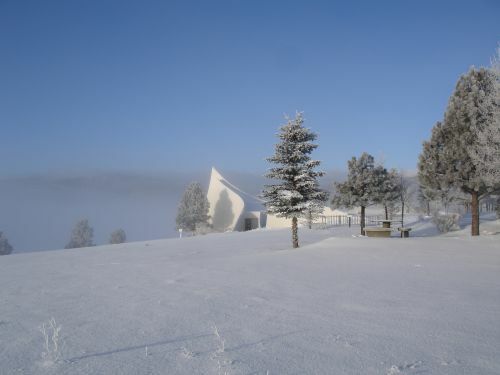 The chapel sits high on a hill overlooking the Moreno Valley. Beautiful foggy mornings like this a very common. Our library includes over 800 books. They can be checked out by visitors for a one-month period. Our computers are loaded with some of the hundreds of photos and documents that are a part of our collection. They can also be used for research. These photos of servicemen killed in Vietnam have been donated by loved ones. There are over 2,000 in the collection. 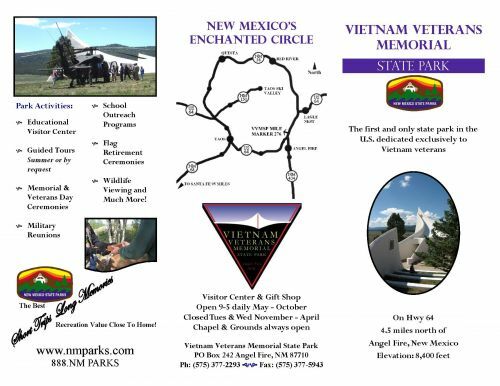 If you have a photo you wish to donate please contact the Gift Shop at (575) 377-6900 for more information. Our visitor center is primarily underground. 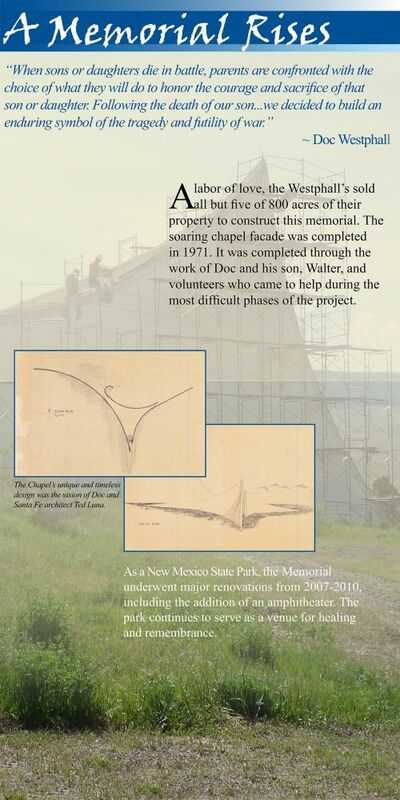 This allows the chapel to maintain its position as the focal point of the park. The skylight seen in the top right corner is right over our lobby. The David Westphall Veterans Foundation Gift Shop is just inside these doors. 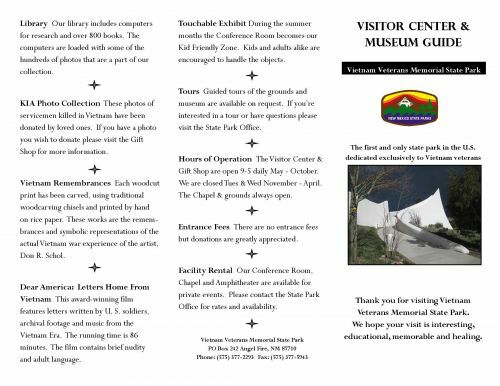 Guided tours are available during the summer months Fridays and Saturdays at 3:00pm and Saturdays and Sundays at 11:00am. Throughout the year they are available on request. 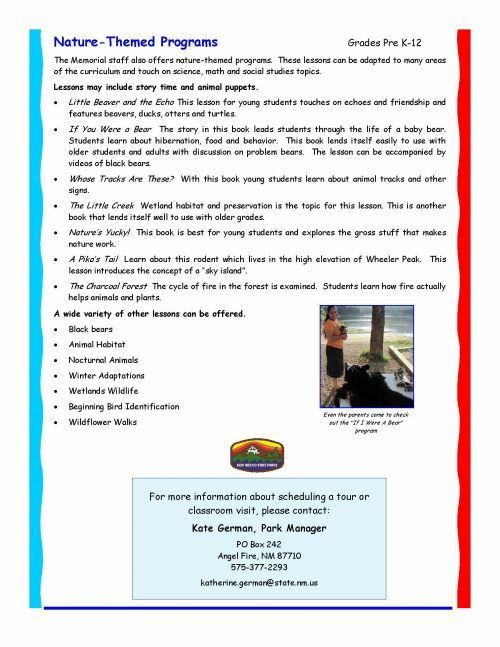 If you’re interested in a tour or have questions please contact our office at (575) 377-2293. In our foyer you can find a wide selection of information about the entire Enchanted Circle to assist you in your travels. 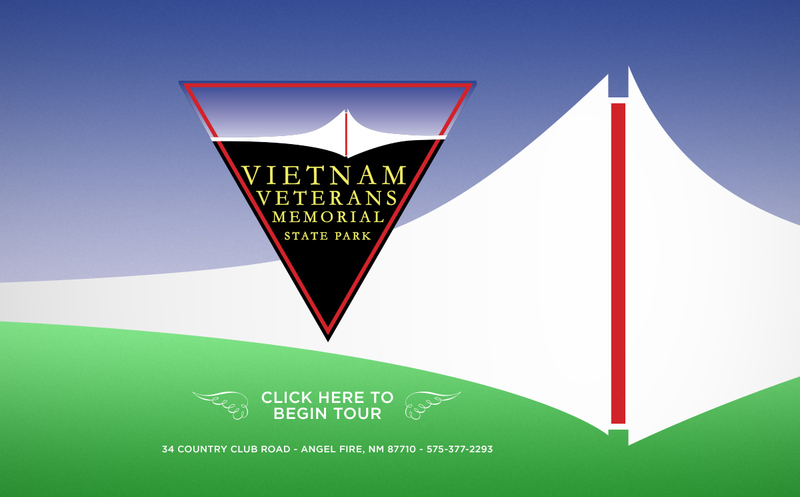 This is the guidon that flew over David's company at Yankee Station (Camp Y) near the Demilitarized Zone separating North and South Vietnam. Is signifies Company B (Bravo) in the First Battalion of the Fourth Marines, part of the Third Marines Division. This flag was flown at the 3rd Force Recon compound right behind Bravo Medical in South Vietnam. 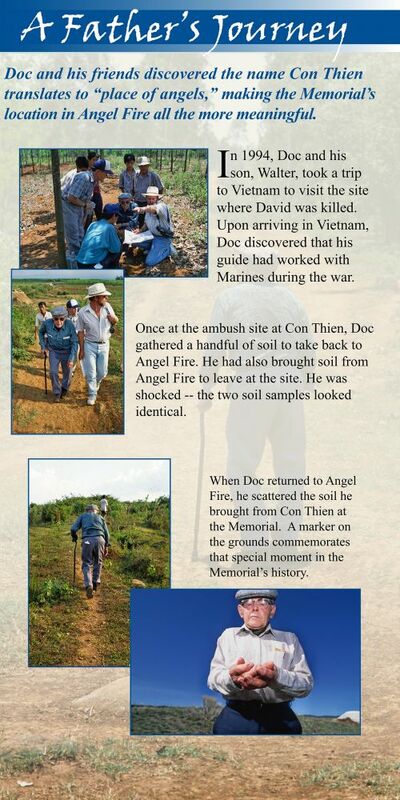 There were at least four types of flags seen being carried by the Viet Cong. Most were hand made and each was a little different. 9:00 am-5:00 pm daily May through October. Closed Tuesdays & Wednesdays November through April. The Chapel and grounds are always open. 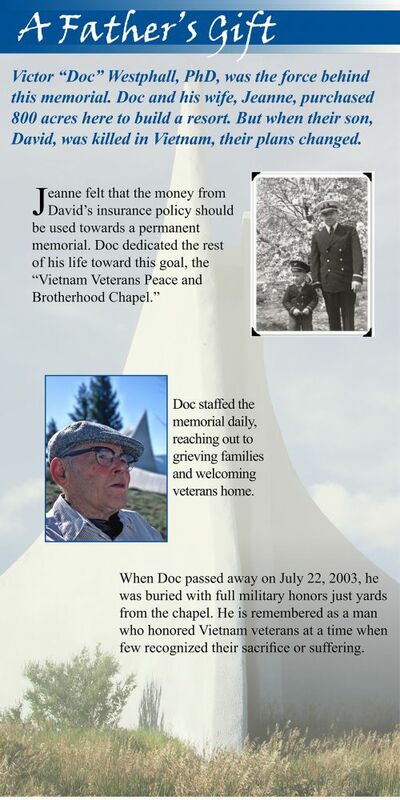 Candlelight Vigil (Sunday of Memorial Day Weekend at 6:00 pm). 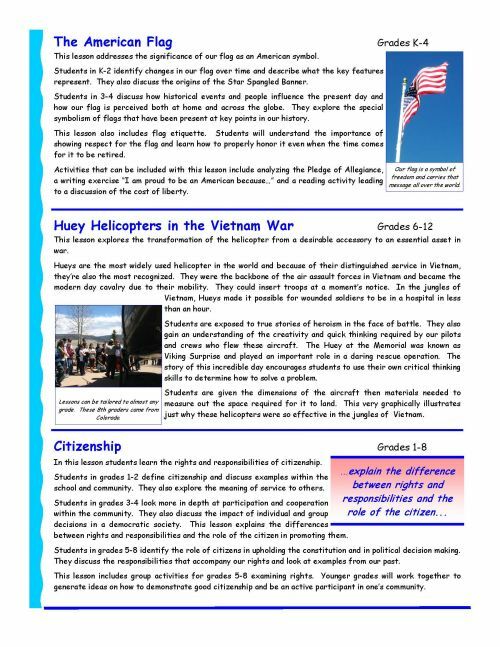 Memorial Day Flag March 9:00 am. Memorial Day Ceremony 11:00 am. Veterans Day Ceremony November 11 at 11:00 am. Flag Retirement (every summer, call for date & time). 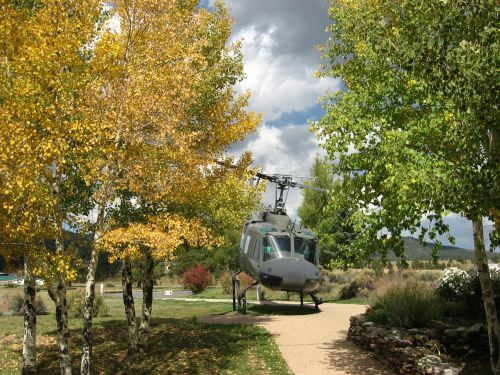 Our Huey served with the 121st AHC as a smokeship and earned the name 'Viking Surprise'. In March 1967 the 175th AHC was inserting troops in the Mekong Delta. The first Huey was shot down. The medevac helicopter that picked them up was also shot down followed by a third. Viking Surprise was requested to assist and by the time it arrived, 13 helicopters had gone down. After its arrival, no other aircraft were shot down. 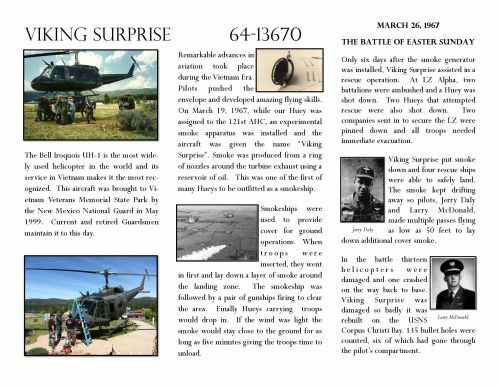 Viking Surprise returned to base badly damaged and was rebuilt on the USNS Corpus Christi. After it was repaired this aircraft returned for duty with the 118th AHC. 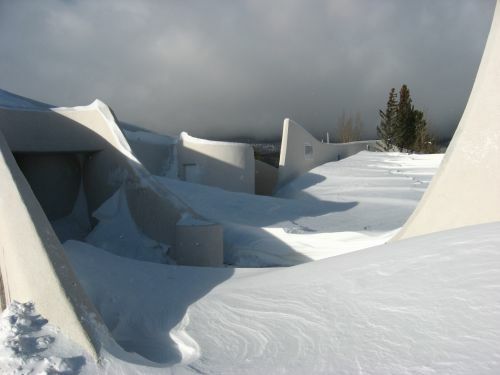 In 1999 the New Mexico National Guard donated it to the Memorial.